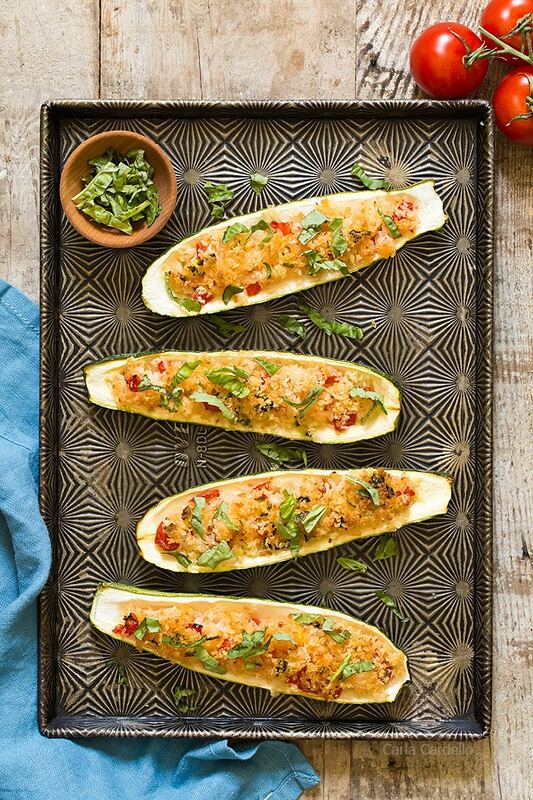 When you find yourself with an abundance of zucchini during the summer, make these meatless Garlic Parmesan Stuffed Zucchini with rice and a crunchy panko topping for dinner. Who has a summer bucket list? Any fun activities you’re looking forward to? Now that it’s June, I’m making a list of things to do this summer – pick fresh cherries, sit on the beach at Lake Erie, visit a few out of town flea markets, go to Kennywood, watch a drive-in movie, eat lots of ice cream cones, and attend all the farmer’s markets. Ok maybe not *all* of them, but I’d like to expand my list of yeses when I need to buy fresh summer produce. So far I have two I really enjoy with a few others being hit or miss. As I’m walking around taking in all of the color and smells – tomatoes, peaches, corn, fresh herbs – I never fail to see a plethora of zucchini begging for a home. Usually you can get 2-3 small ones or 1 giant one for $1. This is the part where I pick up a few and not know what to make when I get home. That’s when it’s a good idea to keep a list of ideas to make on a whim. 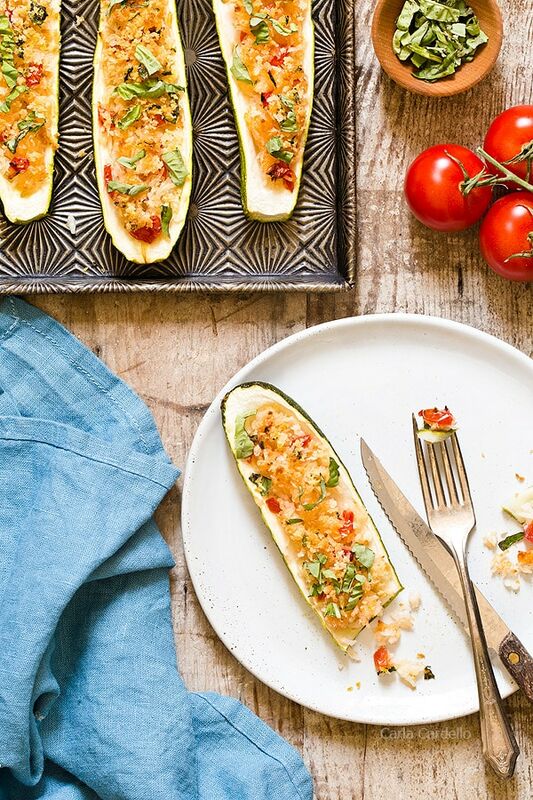 One popular way to eat zucchini for dinner is stuffing it with rice, much like you would stuff bell peppers. Throw in some tomatoes and basil you also bought at the farmer’s market, and soon you’re eating Garlic Parmesan Stuffed Zucchini with rice and a crunchy panko topping for dinner. 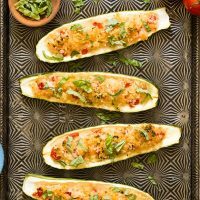 These stuffed zucchini boats are meatless and almost vegetarian; I always forget Parmesan cheese is technically not considered vegetarian. Mozzarella cheese would make a great substitution if you don’t eat Parmesan. 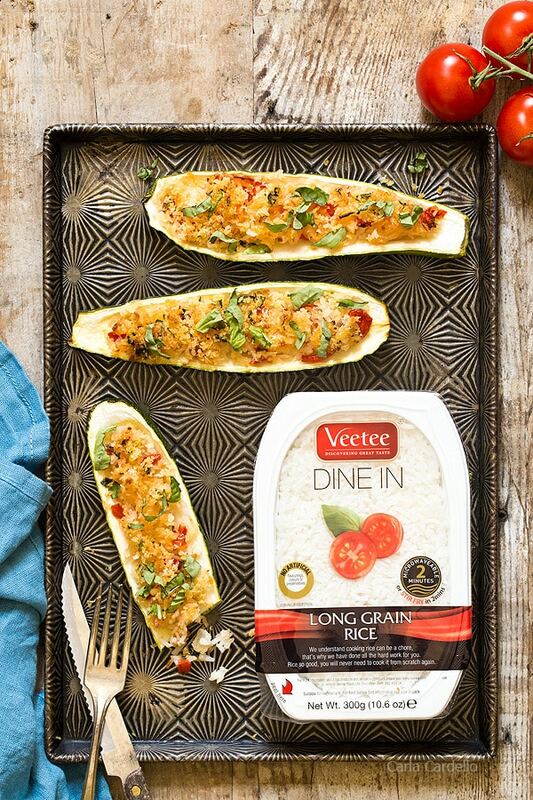 To make dinner even easier and quicker, I used Veetee Rice for the filling. Usually you microwave a tray in 2 minutes, but you can also cook it directly in the skillet without precooking. Crumble it up into the pan, stir everything together, and you’re on your way to stuffing and baking. I used their white long grain rice, which you can find near you via their store locator. Because zucchini can range in size – from normal small ones to GIGANTIC ones as big as your arm – you may have rice leftover. That’s ok! Cook it for another minute or two on the stovetop until the rice is soft then serve extra on the side or reserve it for alongside another dinner, like Honey Mustard Chicken Thighs or Chipotle BBQ Lamb Kabobs. Preheat oven to 400F. Have a baking sheet ready. Cut each zucchini in half lengthwise. Scoop out the middle with a spoon, leaving about a 1/4 inch border. Discard or save for another use. 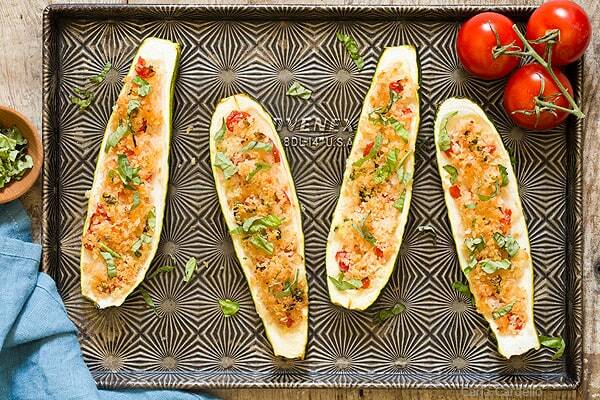 Place each zucchini half on the baking sheet. In a large skillet, heat the oil over medium heat until hot. Add the onion and cook until softened, about 5 minutes. Add the garlic and cook 1 minute. In another skillet, melt the butter. Once hot, stir in the Panko, basil, and remaining 1/4 teaspoon salt. Cook until brown, about 1-2 minutes. 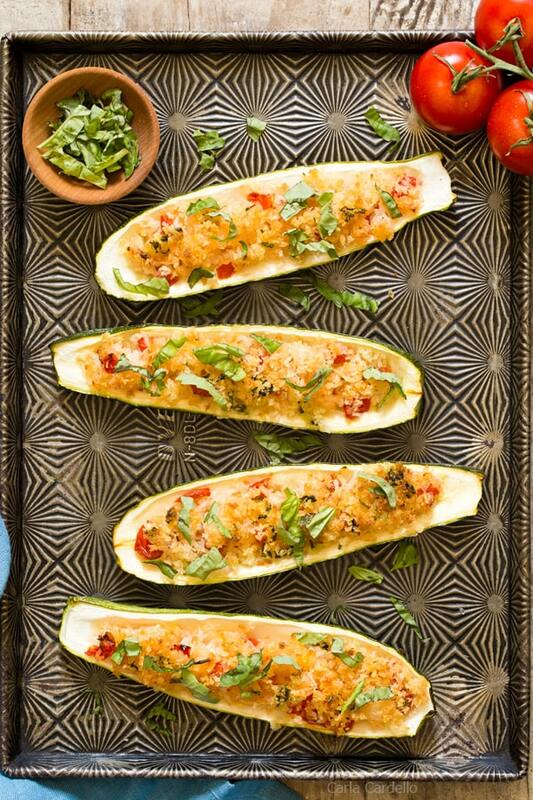 Remove from the heat and top each zucchini half with the breadcrumb mixture. Bake uncovered for 25-30 minutes or until the zucchini is fork tender and the breadcrumbs are golden brown. *Because zucchini can range in size, you may have rice leftover. Cook it for a minute or two on the stovetop until the rice is soft then serve extra on the side or reserve it for alongside another dinner. Disclosure: This post is sponsored by Veetee Rice. As always, thank you for reading and supporting brands I work with, which helps keep Chocolate Moosey running.